Fabulous card and fabulous goodies. Have fun! Wear your tiara with pride, it's well deserved, your cards are absolutely gorgeous... even the rejects! I see why you love this card...it's fabulous! And I'm with the prior commenter...where your tiara with pride and enjoy all the fabulous goodies! Such a sweet card. This, to me, is the perfect CAS card. Love it! This card is lovely Laurie! Love love black and red on white, and the texture is such a great touch! Wow, it's a GREAT card...love it too!! SO, SO beautiful, Laurie! You can execute white space like no other. I LOVE it! Yay! Congratulations on your new box of goodies! You are so deserving and talented! I love the card too - you are wonderful with white space! LOVE that card, Laurie. You have such a great eye for just the right amount of white space. So inspiring! Looks like you got a great haul!!! Can't wait to see what you do with some of those goodies! I love how you use emboss and finish it off with the Scor-Pal. Great card! A reject, surely not - this is gorgeous! This is perfection! Fabulous white space, embossing, and pop of color! Congrats on your new goodies! So simple yet so stunning!!!!!!!!! 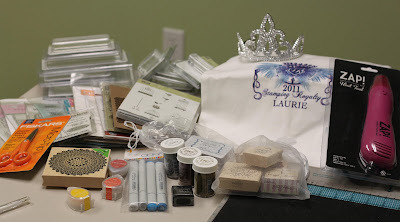 Congrats on your Stamping Royalty goodies!! I have that Hero Arts Starburst stamp...you are going to LOVE it! That is some HAUL girl!!! Of course my favorite part is the tiara :) That card is AMAZING girl!!! Is Raleigh on your list of stops?? Congratulations on your SR win. It's well deserved! i'd take that "reject" any day. way to go stamping royalty; you're wearing your tiara all summer, right? This is really great! I love the double hearts and the partial embossing! Very pretty CAS card! you put that crown on and you strut your stuff, that's AWESOME!!! 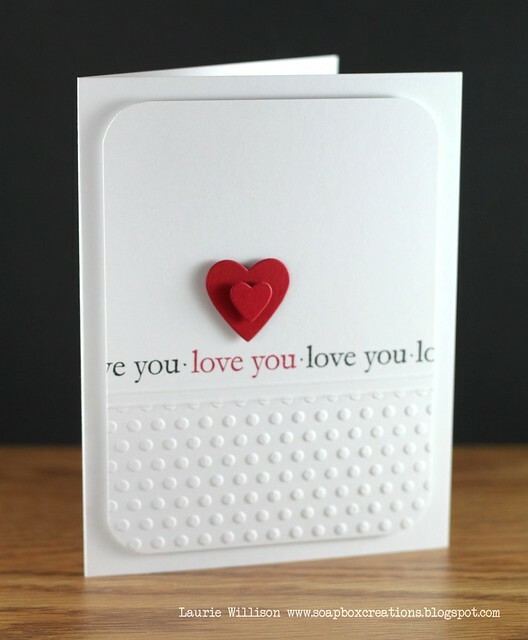 Love all the white space and that polka dot embossing. Just the right amount of WOW! I already told you about your goodies! hehe Enjoy! Wonderful card Laurie!! Partial embossing like this is one of my favorite things to do on CAS cards. Love this! BRILLIANT! One word - that's it. WOW! This is pinned for future CAS-ing!